Ideal Office storage when space is at a Premium. Colour: Dover White and Cyber Grey. 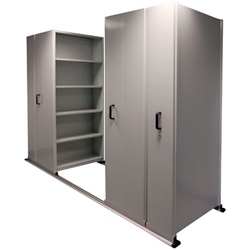 Options: Options other than standard shelves include a pull out Reference shelf and Pull out Filing frame..
Other information: Fully lockable. Quality Colour bond Steel which means 100% Australian made. Shelves have a 75KG load capacity. Can be customised to your area. Width: 900mm and 1200mm options.